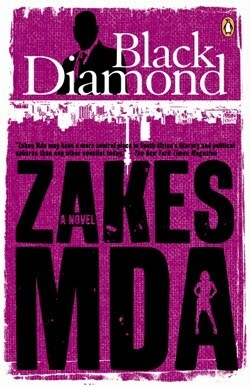 As far as I can tell, Zakes Mda's Black Diamond is only available in South Africa, published as it is by Penguin Books (South Africa). Mda is a widely published author, whose books are generally available throughout the English-speaking world, but perhaps other publishers have been unwilling to pick up this 2009 novel because it is a merciless satire of life in the "new South Africa," a phrase repeated over and over again in the book. There have been previous satirical crime novels from South Africa, published outside of (and in previous years, ONLY outside South Africa), particularly James H. McClure's Tromp & Zondi novels from the 70s and 80s and Tom Sharpe's hilarious early '70s Riotous Assembly and Indecent Exposure (mentioned here previously). More on McClure in a later post, since his novels are finally being reprinted, by Soho Crime in the U.S.
Black Diamond, though, is a post-Apartheid satire, with more in common, perhaps, with the very funny South African political cartoonist Zapiro than with McClure or Sharpe. The title of the book refers to the rising (and risen) black middle class and oligarchs today, particularly in Johannesburg (where Black Diamond is set) and Cape Town. Don Mateza is a bodyguard and security consultant whose former-model wife expects him to achieve more, to become the Black Diamond that she sees in him. Just as he is about to be a possible candidate for CEO of VIP Protection Services, a magistrate, Kristin Uys, is threatened by a petty criminal whom she has sentenced to jail time for contempt of court. The criminal, Stevo Visagie, gets his brother and mother and former nanny to agitate for his release, including threats to Kristin and even her cat. There's a standard love triangle (and even a screwball comedy å la Hollywood in the '40s) there, and Mda doesn't hesitate to go there. But swirling around that part of the story is the very complex racial situation in South African society, exploited here to great advantage. Every aspect of the culture comes under Mda's scrutiny and ridicule, even the traditions of resistance (Stevo's nanny adopts the tactics of Mandela and the ANC, as she sees them, to get her boy out of jail in some of the more merciless comic passages. But Mda never dehumanizes his characters. While the characters of satire aren't typically the fully rounded characters we expect in the best crime fiction, Mda manages to convey the humanity of everyone involved in his cultural portrait. There are some detours in the plot that suggest some of Tom Sharpe's more vicious comedy of Apartheid, but Mda keeps things moving along without getting bogged down in the more sensational (or embarrassing) elements, and the story ends up with everyone if not in their proper place, at least in a suitable position for a screwball noir of the new Republic. Mda's touch is here a bit less folkloric and sympathetic than in his wonderful Ways of Dying or The Heart of Redness, though neither of those uses the conventions of the crime novel (which Mda does for good effect in Black Diamond). I would say to publishers that on the one hand the rest of the world is familiar enough with the new South Africa to understand Black Diamond, and on the other hand, the book is itself a comic guidebook to that culture—more people should be able to read it. I would love to read this book, but, alas, I'm doomed to disappointment unless I want to pay nearly $50 (USD) for a used copy. I wish Penguin would consider putting out these older titles as eBooks. They might be surprised that people outside of SA (like me) are wiling to buy. They seem to be the most reluctant of publishers to move to ebooks, the South African branch anyway.